The comedian is set to play Apple co-founder Steve Wozniak in an upcoming film written by Aaron Sorkin. Here’s why you should be nervous. When comedic actors get dramatic, the results are frequently mixed. A great deal of the time, you end up with something half-cocked and overly sentimental, like Adam Sandler in Spanglish. But occasionally, the perfect performer and the perfect project come together to create something truly special, like Adam Sandler in Punch-Drunk Love. The latest comedian preparing to tickle your serious bone is Seth Rogen, who made headlines last week after being cast as Steve Wozniak in the upcoming Steve Jobs biopic. Written by Aaron Sorkin of The Social Network and The West Wing fame, the film will also star Christian Bale as Jobs himself and is set to be directed by Slumdog Millionaire and Trainspotting’s Danny Boyle. Based on Walter Isaacson’s biography, the movie will reportedly follow an unconventional narrative, focusing on three important moments in Jobs’ life rather than trying to summarize his story in whole. Though it’s not clear yet whether Rogen’s casting is good news or bad news for the movie, it is interesting news. Because regardless of what this take on Jobs looks like, the film has potential to be a revelatory occasion for Rogen, and for the man he’s playing. This isn’t the first time Hollywood has tried to bring Jobs’ life to the big screen. The poorly received Jobs came out in 2013, with Ashton Kutcher in the lead role. The same year, Funny Or Die also released iSteve, a comedic take on Jobs’ story starring Justin Long. And all the way back in 1999, the TV movie Pirates of Silicon Valley depicted the rivalry between Apple and Microsoft, with ER’s Noah Wyle as Jobs and Brat-Packer Anthony Michael Hall as Bill Gates. This minor feud Wozniak is referring to here demonstrates why depictions of not only Jobs, but Wozniak, have been so hard to nail down. 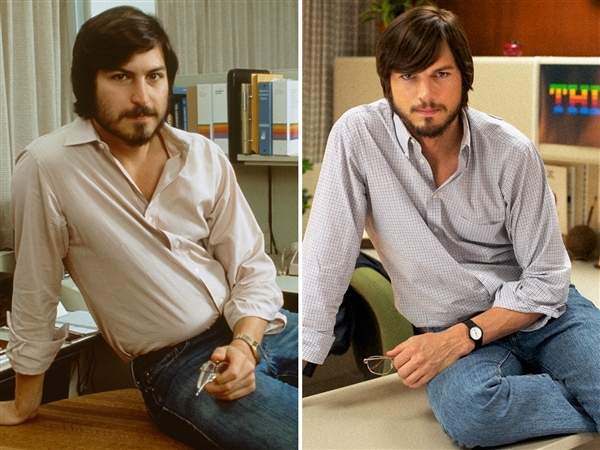 Kutcher was obsessed with Jobs long before filming, and supposedly watched over a hundred hours of footage in preparing to play him. It’s not a stretch for even the most nuanced biopics to have some amount of awe for their subject, and to be fair, it’s not as if Jobs isn’t shown to be kind of terrible in his own right in the Kutcher film. However, Kutcher’s clearly intense love for everything Steve Jobs could only bring him too close to his subject, in a way that left little room for anything interesting. And that’s why someone like Steve Wozniak gets treated fairly shabbily in this type of movie. Portrayed in Jobs by Josh Gad (aka Olaf from Frozen) Wozniak is “characterised as a clumsy, hairy geek,” according to the Telegraph’s Sebastian Doggart. Though it sounds like Gad definitely put his all into playing him, the truth is the type of reductive version of Wozniak Doggart laments should only be expected from a film that treats Jobs with such heroic reverence. Another unflattering portrait came in the form of iSteve, which cast Lost’s Jorge Garcia as a similarly simpering, awkward Woz. However, while Jobs will once again be at the center of this latest retelling of Apple’s history, let’s hope they remember that Steve Wozniak’s role in the company was incredibly important. He was a visionary in his own right, and his contributions to the tech world cannot be understated. Rewind to March 1975: Mr. Wozniak believes the world would be a better place if everyone had a user-friendly computer. This seems a distant dream—most computers are still the size of minivans, and many times as pricey. But Mr. Wozniak meets a simpatico band of engineers that call themselves the Homebrew Computer Club. The Homebrewers are excited about a primitive new machine called the Altair 8800. Mr. Wozniak is inspired and immediately begins work on his own magical version of a computer. Three months later, he unveils his amazing creation for his friend, Steve Jobs. Mr. Wozniak wants to give his invention away free, but Mr. Jobs persuades him to co-found Apple Computer… he’d never have started Apple without Mr. Jobs. But it’s also a story of solo spirit. If you look at how Mr. Wozniak got the work done—the sheer hard work of creating something from nothing—he did it alone. Late at night, all by himself. With Wozniak consulting on Boyle and Sorkin’s take on Jobs, it seems more likely that he’ll finally get some of the respect he deserves. But that still leaves Rogen’s performance to contend with. Casting a more comedic actor in the role could be problematic, as it has been in the past. Not that Gad and Garcia aren’t serious in their own right, by any means. Gad was nominated for a Tony for his performance in the original Broadway production of The Book of Mormon, and Garcia just happened to be one of the more entertaining characters on a very dramatic show. But in both cases, their casting felt like an attempt to put a “funny” actor in the position of second fiddle to be the the laughable sidekick (though as iSteve was a comedy, this decision probably made sense there). The same could easily happen with Rogen, who actually has less dramatic acting experience than Gad or Garcia. While frequent co-star and collaborator Jonah Hill has two Academy-Award nominations under his belt, Rogen has only doubled down on comedy in the past few years, turning out hit after hit, from 2013’s This Is the End to this year’s Neighbors. So far, his only fundamentally “serious” turn has been his part in Sarah Polley’s 2011 romantic drama Take This Waltz. If you look at the career of someone like Steve Carell, another former co-star of Rogen’s, who is currently generating loads of Oscar buzz for his performance in this month’s Foxcatcher, there’s evidence of a drive towards the dramatic (though Carell claims this was never his intention), especially in films like Dan in Real Life and Little Miss Sunshine. Rogen’s career on the other hand is indicative of someone singularly focused on comedy, albeit at a highly consistent and successful level. However, the list of comedians who’ve been nominated for Oscars is long. Sometimes, a born comedian will turn back to funnier films after pursuing more dramatic ones (like Jim Carrey over the last couple of years). But other times, one great, dramatic performance can completely redefine a comedian’s career from there on out, as in the case of Bill Murray in Lost in Translation. None of which is to say that drama is somehow automatically more noble than comedy, or that comedians should be chastised for not stretching themselves to pursue dramatic material. But it is undeniably thrilling to see a comedic actor give a performance that’s unexpectedly sad, or dark, or challenging. And that’s why Rogen is also a fascinating choice for Wozniak. Both Oscar-winners themselves, Boyle and Sorkin should have some idea of what they’re doing, and if they think Rogen can handle the role, and if Rogen wants to take it on, then it’s hard not to get excited. It’ll be a shame if this decision doesn’t pay off though. Not only for the sake of Rogen’s reputation, which could suffer badly if his first big dramatic attempt is a bust, but for the sake of Steve Wozniak’s legacy. There was more than one Steve that made Apple what it is today, and Rogen owes it to himself (and the man he’s playing) to honor that.